Carlie Rinas received her master's degree in occupational therapy from St. Catherine University in Minnesota. 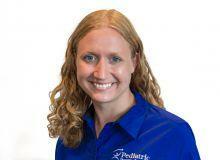 She has over five years experience in outpatient pediatrics, and has also worked in home health, acute care and long-term care. Carlie has certifications in Therapeutic Listening, SOS (Sequential Oral Sensory) approach to feeding, and Interactive Metronome. She has received additional training in NDT (neuro-developmental treatment) and sensory integration.